we had a power-packed schedule this week. our work days were crazy, and our evenings where packed full of all sorts of stuff (most of which was not fun). we're exhausted and tired of running like nuts. we need a vacation. i think i hear a tropical island calling our names. sometimes i get to travel for work. on wednesday evening, i had to take a trip to give two presentations at a not-so-nearby university. three hours in the car in heavy rush-hour traffic is not glamorous. anyway, i got to take ryan with me. after the presentations were over, we grabbed a bite to eat for dinner and the waiter called us twins . . . so there was that. my dad always says "the longer you're married, the more you start to look like one another" . . . but twins? come on. at least there are cookies to make crazy weeks better. thank goodness for cookies. last night after work, before running to another commitment, we headed home to quickly whip up a batch of cookies for a co-worker's birthday today. we had been talking about the glorious cookies at levain bakery in nyc. 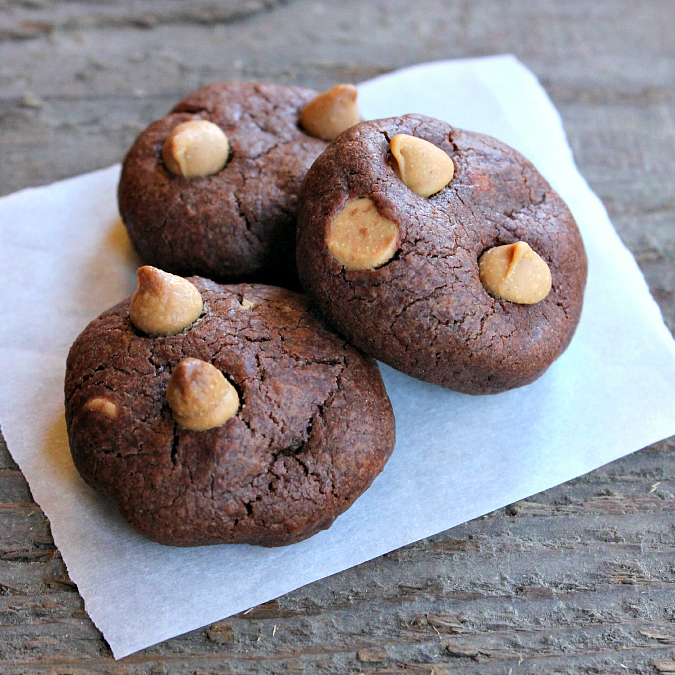 the dark chocolate peanut butter chip cookies at levain bakery are insanely good. then again, all of their cookies are crazy good. so, we made some levain-inspired cookies of our own. if you've ever visited levain, you know that their cookies are ginormous. since quarter-pound cookies are not work place friendly, we made mini bite-sized versions. perfect for our co-workers to pick up on the run. 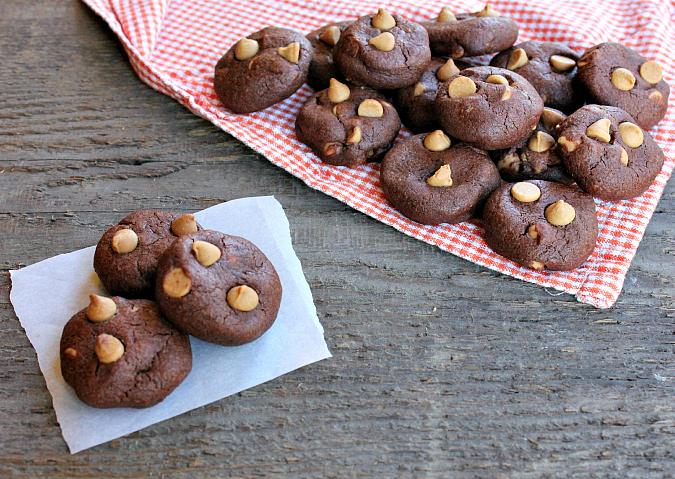 these mini chocolate cookies with peanut butter chips were so easy to make. they came together in no time and baked super quick. just the kind of recipe you want when you have a packed schedule. these cookies smell really great too. 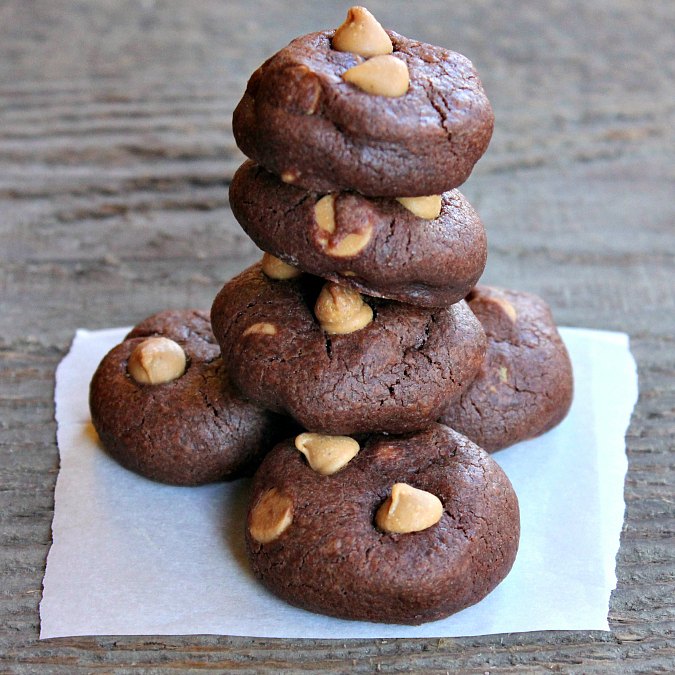 you just can't beat the combination of chocolate and peanut butter. yum! so, if you've had a crazy week, or even if you haven't, i highly recommend these cookies to make you smile. and remember, it's friday! have a great weekend! preheat your oven to 350 degrees F and line a baking sheet with parchment paper. cream the butter in the bowl of a stand mixer fitted with a paddle attachment. add the granulated sugar and beat well until light and fluffy (about 3 minutes). beat in the egg. scrape down the bowl and mix in the cocoa powder until completely combined. add the flour, salt, and baking powder and mix until incorporated. fold in the peanut butter chips with a spatula. scoop 1 teaspoon-sized balls of cookie dough onto the cookie sheet. gently press the cookie dough balls down into discs. bake for 15 minutes. once baked, allow the cookies to cool on the baking sheet for 5-10 minutes before transferring them to a wire rack to finish cooling completely. 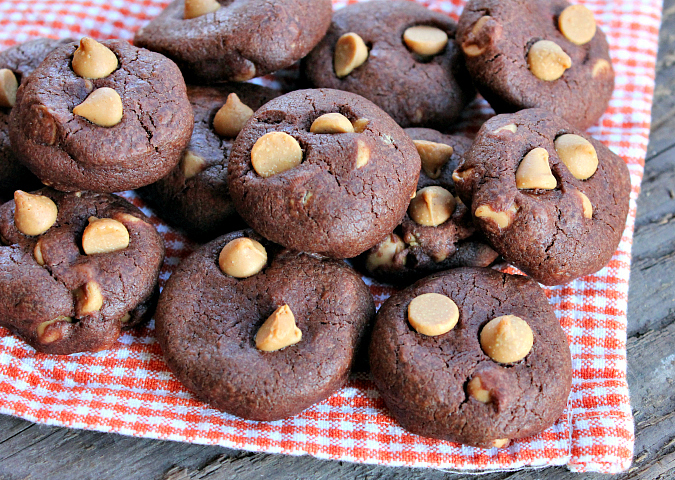 The dark chocolate color of the cookies reminds me of the Chocolate Italian cookies that I make around the Holidays. They do not have peanut butter in them, just a great chocolate flavor. Getting hungry for some.